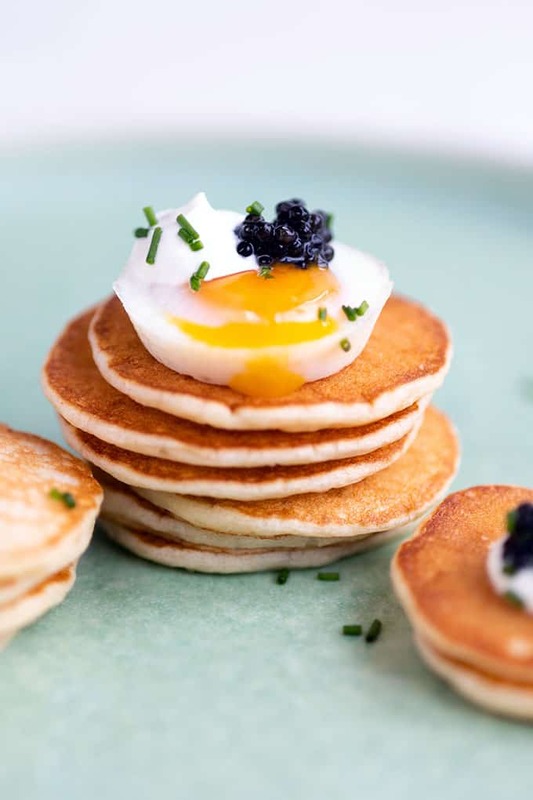 These irresistible caviar blini add a touch of luxury to your dinner or festive table. Serve with champagne or ice-cold vodka. I remember the first time I tasted caviar so distinctly. It was at a fancy dinner date with my then boyfriend (now husband), served over blini with ice-cold shots of vodka on the side. One bite and I was totally hooked! I am quite tickled to finally recreate this sensational little canapé on the blog, several years since that memorable meal. Caviar refers only to the cured eggs of certain species of sturgeon. While other fish eggs, such as salmon and trout, are sometimes termed as ‘caviar’ they are technically roe. Caviar has a a delicate taste that is not easy to describe. While some people refer to caviar as ‘fishy’, this is far from my experience. Instead it has a subtle fresh aroma reminiscent of the sea and a buttery, sweet-briny flavour that fills your mouth as the small caviar grains pop. Attilus means ‘great sturgeon’ in Latin and the brand is dedicated to producing the finest surgeon caviar in their sustainable fishery in Germany. They are one of only a handful of producers worldwide to offer real Oscietra caviar. Royal Siberian: a wonderfully subtle tasting caviar produced from the Baeri Siberian sturgeon. This fine-grained caviar has colours that range from black grey to black brown. Royal Oscietra: considered by many one of the finest caviars, with colours ranging from dark olive to golden brown. Slightly nutty with a mellow aftertaste that lingers. Caviar is highly perishable and you should take care to store it in the coldest part of the fridge, towards the back – don’t store it in the fridge doors! Take the caviar out of the fridge for five minutes before serving. If you are serving caviar on its own, place the tin over a bed of crushed ice to keep it cool. Once you open your container the caviar will only keep for another 2-3 days, if properly sealed and kept in the fridge. It is best to consume it all in one go and you only need to allow a small portion per person, about 30g (1 ounce). To fully appreciate the flavour of caviar you should sample it on its own. Traditionally it was served using only mother-of-pearl spoons, as metal or silver spoons can alter the delicate taste. If you don’t happen to have any fancy spoons about, you can use spoons made of ceramic, wood or plastic instead. Serving caviar over blini or toasted brioche with a little sour cream or crème fraîche and a scattering of fresh chives is a classic. In Russia, very finely chopped hard boiled eggs (yolks and whites separate) are also offered as accompaniments . Caviar also pairs well with eggs, potatoes, scallops and generally foods that have a mild taste that will not overpower it. Blini are a type of pancake made from wheat or sometimes buckwheat flour. Traditionally from Russia and the Ukraine, blini come in a variety of sizes and can be served in different ways. I used the yeasted bite-sized version for my caviar blini. They take a little longer to prepare but they are incredibly delicious – perfect if you want to impress! I used dried easy bake (“fast–acting”) yeast in this recipe – the type used in bread machines. This type of yeast is typically mixed in with the flour and doesn’t require proofing first. Combine melted butter, whole milk, cream, warm water and an egg yolk in a large bowl. It is best if all the liquid ingredients are at room temperature. Sift flour, yeast and sugar over the liquid ingredients and then use a balloon whisk to slowly combine until you have a smooth batter. Cover the bowl loosely with a cloth or plastic wrap and leave to rise in a warm spot for 1-2 hours. The batter will have risen slightly and have bubbles over the surface after this time. Whisk the egg white and salt with a hand mixer until soft peaks form and then gently fold into the batter. Heat a non-stick frying pan and wipe with a little flavourless oil (you can also use clarified butter instead of oil or a cooking spray). You don’t want the pan to be greasy or full of oil, just enough so that the blini don’t stick. Add 1 tablespoon of batter per pancake and cook over medium heat until bubbles form on top and the surface appears dry. Flip over and cook on the other side until nicely coloured, this should only take a minute or so. Set aside while you use up the remaining batter. The blini can be kept at room temperature for an hour. Add a small dollop of sour cream on each little pancake and carefully top with a little caviar, about 1/4 of a teaspoon. Sprinkle with finely chopped chives and serve immediately. As a variation you could also add oven-poached quail’s eggs (see recipe notes) on top of the blini – so delicious! This recipe makes about 60 (!) bite-sized pancakes and you can easily freeze any cooked leftovers. Cool the blini completely then store in a container, separated by greaseproof paper. Attilus Caviar offer delivery throughout the UK and across mainland Europe. They also have a retail shop in Marylebone (92 York Street) in London. These irresistible caviar blini add a touch of luxury to your dinner or festive table. Serve with champagne or ice-cold vodka. Makes approximately 55-60 bite-sized pancakes. Combine melted butter, whole milk, cream, warm water and egg yolk in a large bowl. Sift flour, yeast and sugar over the liquid ingredients and then use a balloon whisk to slowly combine. Whisk the egg white and salt with a hand mixer until soft peaks form and then gently mix into the batter. If the batter appears really runny at this point, sift an extra two tablespoons of flour over it and gently mix it in. Heat a non-stick frying pan and wipe with a little flavourless oil. Add 1 tbsp of batter per pancake and cook over medium-low heat until bubbles form on top and the surface appears dry. Flip over and cook on the other side until nicely coloured, this should only take a minute or so. Set aside while you use up the remaining batter. Add a small dollop of sour cream on each little pancake and carefully top with a little caviar, about 1/4 of a teaspoon. Sprinkle with finely chopped chives and serve immediately. As a variation you could also add oven-poached quail’s eggs (see recipe notes) on top of the blini – so delicious! To make oven-poached quail eggs: Preheat the oven to 150°C (300° F). Spray a mini cupcake tin with cooking spray. Carefully crack one quail egg into each hole** and top with a little water. Bake for about 5 minutes until the whites are set but the yolks are still runny. Leave to cool in the muffin tin for 3-4 minutes and then carefully scoop out using a teaspoon. Best used immediately, otherwise the yolks will eventually start to set in the residual heat. ** Quail eggs have quite a hard shell! You might need to break them into a little bowl first then transfer to the tin. I wish I was brave enough to try caviar again because I need make and eat these. I love blinis! Looks delicious! I love good quality caviar and Attilus looks pretty good. Lovely pics! Mmmm I love this recipe. It would have been my perfect appetiser. I can not wait to try. Thanks! Wow, these are one of the best looking appetisers I have seen for a long time. The cavier is very fancy and combined with the blini takes these to a next level, great recipe! I love caviar with sour cream but I alway had it on the cracker… blini sounds waaay more tasty that simple cracker. That’s why I must give this a try. Looks really elegant and beautiful.